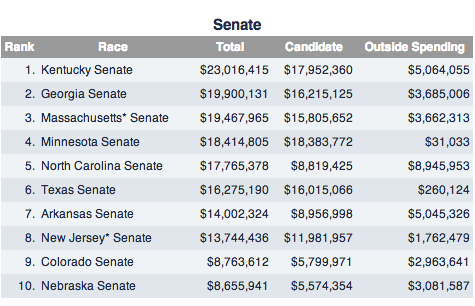 The Kentucky Senate race figures to be among the most expensive in the country, and that's likely to become an issue itself in the race. 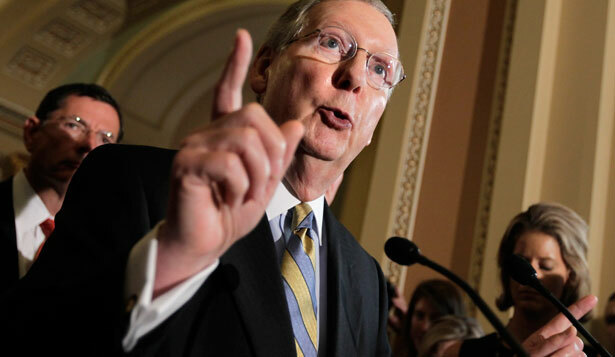 As expected, Senate majority leader Mitch McConnell blew his rather hapless conservative opponent out of the water in Tuesday night’s Kentucky Senate primary election. His Democratic challenger, Alison Lundergan Grimes, cruised to an easy victory as well. The contours of the race immediately became clear: in a state where he’s not, and never has been, particularly popular, McConnell will instead make the race about Barack Obama. The man who famously dictated McConnell’s agenda as minority leader, per McConnell’s declaration that his “number-one” goal was to deny the president a second term, will now also dictate McConnell’s re-election campaign. Lundergran Grimes, in her victory speech, telegraphed many themes to come—that McConnell is too much of an insider and wheeler-dealer; that he’s been in the Senate too long (along with some pretty explicit insinuations that he’s also too old); that his obstruction and lack of focus on the middle class should disqualify him. But she also began in earnest an attack not only on McConnell but on the massive amounts of outside money that will be spent on the race. “With his millions of DC lobbyists, insider dollars and out-of-state political action committees, Mitch McConnell is going to try to buy his way back to Washington, DC with deceitful, untruthful, negative nasty ads that will try to distort and distract from his failed record,” she said. McConnell is arguably the most powerful and well-connected GOP figure in Washington who can beckon boatloads of corporate money to his cause. Moreover, he is better served by ads from outside groups, like the above from “Kentuckians for Strong Leadership,” which is actually a state-based spinoff of Karl Rove’s American Crossroads outfit. Studies show voters are much more likely to listen to advertisements with generic backers, instead of clearly partisan sponsors, and that’s particularly true in a state where the incumbent really isn’t that well-liked. McConnell needs these ads badly, and that’s why Lundergran Grimes is attacking them directly and making it clear who is responsible. It must be noted that Lundergran Grimes herself will also rely on quite a bit of outside money (though, so far, much less than McConnell) and she’s obviously overstating her case when she mentions “millions” of DC lobbyists loyal to McConnell. But her goal is to successfully tie the vast amounts of outside money in the race to McConnell, and make it clear who those generic, friendly groups are working for. There weren’t any shockers in last night’s primaries, but the stage was set for some really interesting fall races. In Georgia, two GOP Senate candidates qualified for a runoff election—Representative Jack Kingston and businessman David Perdue. The more radical Tea Party candidates failed to qualify, but Politico notes the runoff “will be nasty, brutish – and long.” Democrat Michelle Nunn easily won her party’s nomination. In Pennsylvania, self-funded Democratic candidate Tom Wolf easily won his primary and will face the deeply unpopular incumbent Tom Corbett, who supported an unpopular mandatory ultrasound bill, and did so quite tactlessly. (“You just have to close your eyes,” he infamously said.) Democrats in the state also plan to make Corbett’s refusal to tax fracking outfits, which are booming across the state, a central issue. In Oregon, the beleaguered Monica Webhy prevailed in the GOP Senate primary, and will face Senator Jeff Merkley in the fall in what will also no doubt be a very expensive race. In Idaho, Representative Mike Simpson beat back a challenge from a Club for Growth–backed candidate, scoring another win for the GOP establishment.